Panasonic is one of those brands with a reach that stretches beyond mere HDTVs and Blu-ray players. In fact, the manufacturing giant makes everything from electric toothbrushes to refrigerators, so it should come as no surprise that they too wanted to cash in on the headphone craze by coming out with their own lineup of ear cans. Among them the RP-HC200-Y (HC200), reviewed here, which is one of Panasonic's latest active noise-canceling designs. But is it any good? 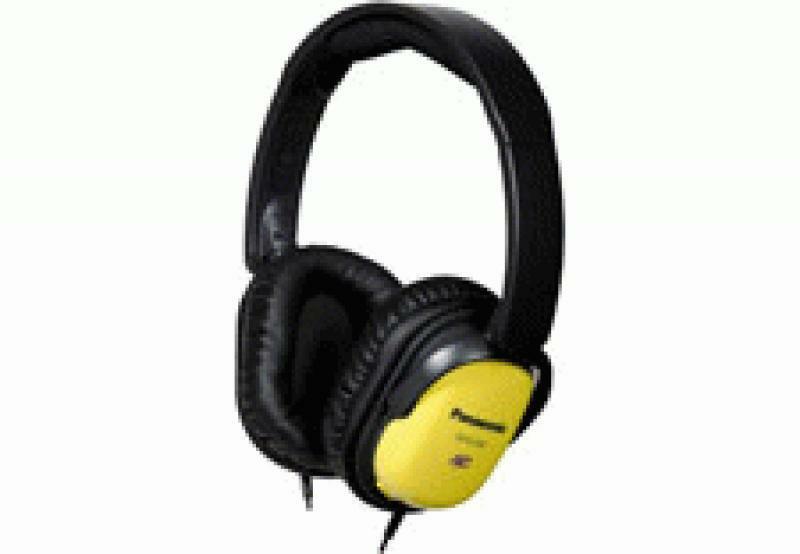 • Read more headphone reviews written by Home Theater Review's staff. • Learn more about sources in our Source Component Review section. • See reviews of iPod docks. The HC200 retails for $79.99 and is available nearly anywhere Panasonic consumer electronics are sold, including direct via Panasonic's own website, though their website claims the HC200 is for pre-order only. The HC200 is pretty pedestrian in its shape and style though Panasonic does attempt to dress things up a bit by offering them in a wide variety of colors, which include black, a light blue-gray, yellow and light gray (almost white). I'm guessing at the actual colors, for Panasonic doesn't list the colors by name on their website. The headphones themselves are an over-the-head, closed ear design, featuring a rather well-padded, adjustable head strap and cushioned ear cups. The ear cups create a tight seal around the ear that, when used in conjunction with the HC200's active noise cancellation, is said to reduce ambient noise or outside distractions by 14dB, which is significant. The headphones themselves utilize two 35mm drive units, one per ear, giving the HC200 a reported frequency response of 10Hz to 21kHz. Impedance is listed at 32 ohms when the headphones are "off" and 330 ohms when "on." The on/off is in reference to the HC200's noise cancellation, which can be turned on and off via a small switch on the left ear cup. Sensitivity is rated at 94dB, with a max input of 1,000mW. The HC200 comes standard with a myriad of accessories. Included is a black carry-on bag which houses the fold-flat-designed HC200 when it is not in use. Also, Panasonic provides an Air Plug adaptor standard. An option that is missing from the HC200's repertoire is an on or in-cord volume control, meaning you cannot control the volume of your music or portable music device from the HC200's nearly five-foot cord. The HC200 comes standard with a 3.5mm miniplug, featuring a pronounced 90-degree angle, which may or may not be a hindrance with certain devices. In terms of its performance, the HC200's noise cancellation properties work well. While I didn't have the opportunity to travel with the HC200, I did use it while seated next to my home's swamp cooler, which sounds eerily similar to a 727 during takeoff. With the noise-canceling engaged and with music playing, the HC200 is an isolating affair. It even withstood and protected my ears from the sound of a 9mm gunshot (DO NOT TRY THIS AT HOME) when active and with music playing at moderate levels. The HC200's sound isn't one I'd classify as wholly hi-fi, however. It's not that the HC200 sounds bad, but a critical listening device it is not. High frequencies lack natural air and sparkle; instead, they come across as sounding decidedly digital and a bit two-dimensional. Midrange performance is a bit anemic and flat, with the bass being the worst of all, possessing almost no extension or depth. Sure, bass hits and notes are present, but they fail to stir the soul the way other similarly-priced cans can and do. The entire presentation is skewed towards the upper frequencies, which gives the HC200 a forward and lean presentation. Additionally, there is an overly pronounced sense of grain present throughout that is noticeable and somewhat distracting during quiet passages. At higher than moderate levels, it's also possible to get the HC200 to compress; at loud volumes, it completely falls apart. Read about the high points and low points of the HC200 on Page 2.